The symphonic overture Excelsior!, written for the Berlin Philharmonic Orchestra in 1896, was composed only four years after Wilhelm Stenhammar made his d�but as a composer. 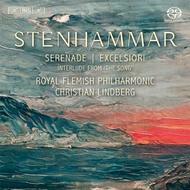 Stenhammar had not yet entirely found his own voice, but the work displays an infectious exuberance and enthusiasm, contrasting with the more reflective �Interlude� from the composer�s final large-scale work, the cantata S�ngen from 1921. Closing the disc is the Serenade in F major, often regarded as Stenhammar�s finest orchestral score. This is the Royal Flemish Philharmonic�s first recoding for BIS.